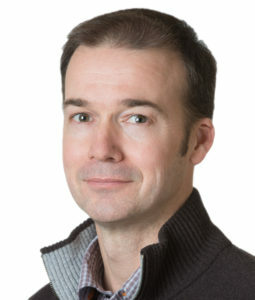 Mark Bevan, PhD, professor of Physiology, was the senior author of the study which found maladaptive brain plasticity in a model of advanced Parkinson’s disease. The brain’s own mechanisms for dealing with the loss of dopamine neurons in Parkinson’s disease may be a source of the disorder’s abnormal movement, according to a Northwestern Medicine study published in Neuron. The study suggests the loss of dopamine may cause the brain to rewire in a maladaptive manner, contributing to impaired movement in Parkinson’s disease. These findings also suggest that there are fundamental problems with scientists’ traditional model of Parkinson’s disease, said senior author Mark Bevan, PhD, professor of Physiology. The prevailing consensus was that excessive patterning of the subthalamic nucleus (STN), a component of the basal ganglia, by the cerebral cortex was linked to the symptomatic expression of Parkinson’s disease, including muscle rigidity and slowness of movement, according to Bevan. “When one saw a burst of activity in the cortex that was consistently followed by an abnormal burst of activity in the STN, scientists assumed that the direct connection between the two was responsible,” Bevan said. Thus, Bevan and his colleagues, including lead author Hong-Yuan Chu, PhD, a post-doctoral fellow in the Bevan Lab, expected to see transmission in the cortex-to-STN pathway increase as dopamine levels dropped. Instead, they found the opposite: the strength of the pathway decreased massively. 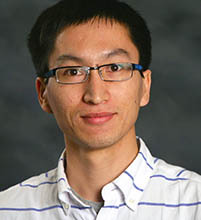 Hong-Yuan Chu, PhD, lead author of the study published in Neuron. Further investigation suggested abnormal activity in a more indirect pathway from the cortex to the STN, involving the globus pallidus, was responsible. Abnormal activity in the indirect pathway leaves the STN vulnerable to excessive excitation, triggering compensatory plasticity that ultimately proved to be harmful, according to the study. When the scientists prevented this maladaptive plasticity in late-stage Parkinson’s models, they found the symptoms improved, pointing to a link between compensation and motor dysfunction. While the compensatory mechanisms may initially keep the brain operating normally under conditions of moderate dopamine neuron loss, as the disease progresses and more dopamine neurons die, the adaptations may become so extreme that they impair movement, according to the study. These results suggest that there are fundamental flaws in our traditional understanding of brain dysfunction in Parkinson’s disease, Bevan said. For Bevan, the unexpected results in this study served as a reminder that scientists must remain open-minded. This study was funded by the National Institutes of Health’s National Institute of Neurological Disorders and Stroke grants 2R37 NS041280, P50 NS047085, 5T32 NS041234, and F31 NS090845. Confocal imaging work was performed at the Northwestern University Center for Advanced Microscopy, which was supported by National Cancer Institute Cancer Center Support grant P30 CA060553.